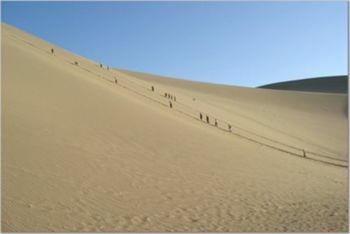 Dunhuang (敦煌; Dūnhuáng) is a city on the old Silk Road. It is in Gansu Province in north west China. The city was founded by Emperor Wudi of the Han dynasty in 111 BC at the cross roads of two trading routes on the Silk Road, and the name 'Dunhuang', meaning to 'to flourish and prosper,' gives some indication of the town's prominence in ancient China. It is much less important today. The city is a neat small sizes city centred around a statue and the lovely market. Dunhuang Airport (IATA: DNH) is 13km east of town center. Flights are available to Beijing, Lanzhou, Urumqi, and Xian. There is now a taxi stand at this airport (Sept 2013). Taxis do not run on meters and the charge is 50yuan for trip to city. If you can get your hotel to pick you up, please do so. There can be shuttle busses which arrive when planes come, but these can be full, resulting in a long wait (1 hour) for a vehicle if you're not prepared. The airport and train station are just 10 mins walk away. So one can take walk to the train station to take the bus to the city. Dunhuang Train Station (敦煌火车站; Dūnhuáng Huǒchēzhàn) is about 12km outside the town to the northeast.It a new well organised station with green buses meeting every train to shuttle passengers into town. Just come out the front and they will usher you into the next bus and for 3 yuan drop you opposite the Silk Road Hotel in town on the edge of the market. There is also a ticket agent in town, near the mosque which sells tickets for most trains. You can always get the bus back to the railway station to buy your ticket if you are heading to the Caves as the Caves entrance is a walk from the station. Please note: If you are heading west you will have to have to catch a bus to Liuyuan as DUNGHUANG is a branch off the main line and you would have to backtrack and change trains. Buses leave for Liuyuan to connect to each train. They leave from the bus station 5 mins down the road from the Silk Road Hotel (where the Dunghuang Train Station shuttle buses drop you). The trip takes 2 hrs and cost 36Y . There is not much at Luiyuan. The Dunhuang train station is pretty quiet as mentioned it is the end of a branch line and most trains stop at Liuyuan (柳园), a couple of hours away from the city. From 2015 most buses leave from the main bus station -walk out 5 mins away from the market past the Silk Road Hotel (where the Train Station and bus to the Caves Depart). As of 2015 there is no overnight bus heading to Turfan. You will have to take a Western train option. Taxis do not seem to make this 13 hour run. Mogao Caves (莫高窟), (25km from town, most people visit on pre-arranged tour or arrive by taxi or take the green city bus to Mogao for 8 yuan each way. 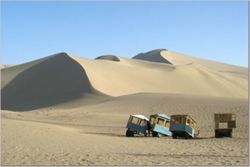 The bus also stops at the train station, and picks up and returns in front of the Silk Road hotel in Dunhuang city, as well as just outside Charley Johng's cafe). . The Visitors center and entrance is on the main road (almost opposite the train station), whilst the actual caves are afurther 13 km in on a shuttle bus as part of your admission. You must join a tour group as the caves are locked and only the tour guides have keys.English tours at 9AM, 12AM and 2PM daily (2:30PM in low season). If you can't get a tour in the right language you will need to tag on to one of the Chinese tours.. A UNESCO World Heritage Site filled with exquisite Buddhist art and manuscripts. 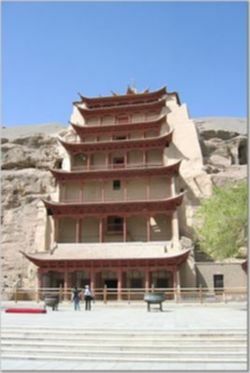 Although the city had an early connection with Buddhism due to the passage of monks traveling the Silk Road, it was not until a monk had a vision of a thousand Buddhas above the desert at Dunhuang in 4th century that the famous caves were excavated and filled with the manuscripts and treasures.The tour takes about two hours and 12 caves will be visited , all the rest are closed. The tours are different from group to group with every group visiting the main caves. The number of visitors is limited to 6000 a day and advanced booking needed in peak seasons. You can arrange to visit closed caves, It will cost you ¥200 per person and per cave. Note that It can be handy to bring your torch. Worth a visit even if you don't pay the steep entrance fee and tour the caves, as the museum is free to enter and contains replicas of several caves, and there are a few small temples you can easily hike to in the nearby hills. 50% discounts available for students, however a Chinese student card is required. Quad biking in the Desert (arranged by Charley Johng's or John's Cafe). edit Quad bikes rented by the hour (400-500 yuan per hour), go racing around the dunes. There's a normal-priced supermarket opposite the long-distance bus station (beside Feitian Binguan) to stock up on water, snacks and other groceries. Silk Road - The route between Dunhuang and Cherchen (Qiemo) is probably the hardest to do in all of the Silk Road travels since public transit is complicated between the two points. One leg of the trip is often closed due to washouts in the river canyon or landslides in the mountains, and is closed to most traffic in the winter. Be sure to ask, before you leave Dunhuang, whether the road between Shimiankuang and Charklik (Ruoqiang) is open. Regular buses run daily each morning from Dunhuang, Gansu Province, 731 km to Huatugou (花土沟), a small oil drilling town in northwest Qinghai Province, and daily each morning the other direction. This road, a paved highway the entire way, crosses the Altun Mountains over Dangjin Pass (当金山口, 3680 m, 39º19'14"N, 94º16'11"E) at the provincial border between Qinghai and Gansu which runs along the crest of the Altun Mountains. One source says that the road rises from 1000 m to the 3680 m pass in just 20 kilometers. This road is subject to delays or closure in winter due to icy conditions. Twice daily minibuses run the 65 km in 1.5-2 hours for Y15 between Huatugou and Shimiankuang (石绵矿 literally: asbestos mine), a tiny worker hamlet north of a large surface-level asbestos mine. It's better to stay overnight in Huatugou than in the very basic lodging at the asbestos mine. Ask the Huatugou taxi driver for the Petroleum Guesthouse -- 石油 shí yóu 宾馆 bīn guǎn. There's also very basic lodging across from the Huatugou bus station -- ask the bus driver to point you in the right direction. Some maps do not show Huatugou (38°08'60"N, 90°52'00"E, 2,859 m) and instead show Youshashan, about 5-10 km southwest. If neither town is shown, Huatugou is just northeast of Gaz Hure Hu lake. Some maps do not show Shimiankuang (38°15'00"N, 90°52'00"E, 3,200 m) and instead show the small oil refinery village of Mangnai Zhen, about 10 km southeast. If neither town is shown, Shimiankuang is right where Highway 315 crosses the provincial border. Older maps show Shimiankuang and Mangnai Zhen in Xinjiang Province, but the area was moved administratively some years ago into Qinghai Province. The 241 km road from Shimiankuang, at the border of Qinghai and Xinjiang, to Charklik (Ruoqiang), Xinjiang, is a rough road, over a 4,000 m pass and through a narrow river valley as well as across the desert. This is the rough leg mentioned above. April 2011 - the road is now paved all the way. a minibus leaves from Shimiankuangs "bus station" to Charklik at 11:00 , costs 80Y. The minibus leaves from in front of the bus station in Charklik (Ruoqiang) at 08:00 Beijing time (06:00 unofficial local time) and arrives in Shimiankuang about 6 hours later, and generally in time to catch the afternoon minibus from Shimiankuang to Huatugou. The 09:00 morning minibus from Huatugou meets the minibus leaving from Shimiankuang about 11:00. From Charklik (Ruoqiang) to Cherchen (Qiemo), the bus leaves at 10:00, takes 5 hours to cover the 351 km and costs 58Y. In the other direction, a daily bus leaves Cherchen (Qiemo) for Charklik (Ruoqiang) at 10:00. There as buses to Delingha, but be carefull, the city is not open to tourists. Beijing - Although there are direct flights from Dunhuang to Beijing, they aren't cheap and are booked pretty quickly. A cheaper and less competitive alternative is to look for flight to Urumqi then from Urumqi to Beijing as this route can save you almost half the price of direct flights to Beijing. This page was last edited on 19 June 2018, at 10:55.